New 64-bit architecture supports deeper, multilayered effects for use in Final Cut Pro. ColorSync-managed color pipeline produces accurate, consistent color across applications. Shared Render Engine provides consistent quality with Final Cut Pro and Compressor. Rendering uses floating-point, linear-light color space for exceptionally realistic results. 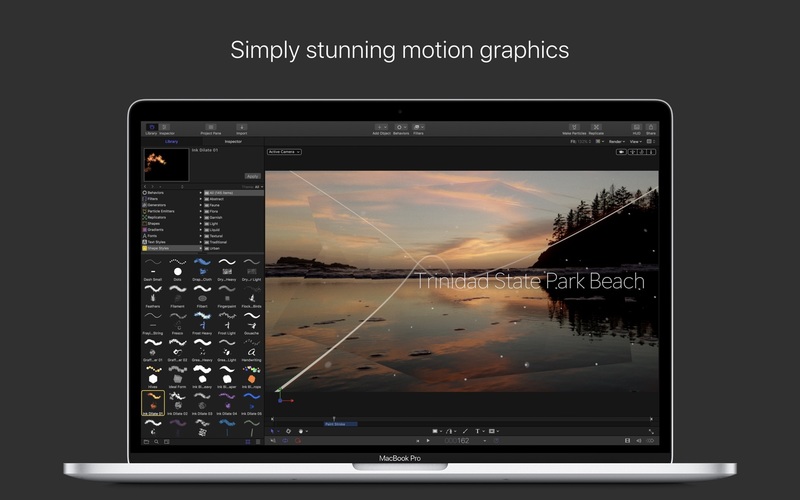 Motion taps the GPU on the graphics card for high-speed rendering and exporting. Work fast using a single-window interface with a familiar look and feel. Customize Final Cut Pro titles, effects, and transitions by opening them in Motion. Create Smart Motion Templates with simple controls for making changes as you edit. Build stunning 2D and 3D compositions with more than 1900 Apple-designed elements. Make adjustments to any parameter during playback and instantly see results. Design dramatic text effects with complete control over position, opacity, rotation, and more. Animate text instantly by choosing from more than 200 text behaviors such as Type On. Build a credit roll by importing a text file; the Scroll behavior optimizes the speed for you. Move, scale, or rotate a single character with the Adjust Glyph tool. Ripple text one character, word, or line at a time with the Sequence Text behavior. Choose from more than 230 behaviors for natural-looking motion without programming. Enhance your 2D or 3D animations with more than 130 filters using the FxPlug 2 standard. Track a moving object in a video clip with the point tracking and match move feature. Create an accurate chroma key in a single step with the new Keying filter. Apply the Linking behavior to make parameters for one object animate related objects. Use SmoothCam to eliminate camera jitters, and image stabilization to smooth bumpy shots. Transition from 2D to 3D space by adding a camera or cameras to any 2D project. Set up realistic shadows that animate dynamically with the movement of cameras and lights. Turn any shape, video plane, or paint stroke into a reflective surface. Highlight or de-emphasize various objects by defining a range of focus. Track objects or groups of objects with the Camera Framing behavior. Export projects to Apple devices and popular websites such as Vimeo and YouTube. Choose to output the ProRes 4444 format for uncompressed quality at small file sizes.